and include the very cream of Chippendale's designs. No possible exception to their selection or introduction can, therefore, be taken. Yet there is a certain individuality about the majority, though not all, of the pieces illustrated, which marks them most distinctly and unmistakably as " Chippendale," so that, permeated by French influence as they are, they could not be described with any degree of accuracy as in the French Style. Take, for example, all the chairs shown on Plates I., II., III., IV., V., VI., and IX. In what, then, reposes the secret of this individuality ? The explanation is not far to seek. The truth is that Chippendale elected, as a general rule, to follow on the lines of the Parisian chair maker in the matter of detail rather than in that of form, as will be apparent from an examination of the chairs referred to ; and, although he indulged to his heart's content in the employment of Rococo coquillage, it was generally employed by him—I am speaking of his chairs now—to " dress up " forms of a comparatively simple character. The same remark applies, though in a smaller degree, to his cabinet work, but that we shall discuss later. The general outline, or shaping, of the majority of " Chippendale« French " chair backs varies but slightly from that of the model indicated in Fig. 1, Plate I.; therefore little or no difficulty will be experienced in classifying them correctly. 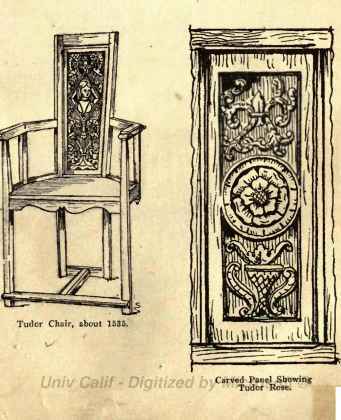 The " Chippendale-Chinese" chairs, it is true, differ from these almost in every point; but they form a distinct group and will be dealt with by themselves.